I wrote “Charlie and his epitaph” three weeks ago, where I recounted Charlie’s approach towards investing and his endless wait for events. I will never know the correct reasons, but I went back to our years as childhood friends and what shaped our thoughts to find some reasons for Charlie’s behavior. I concluded that he waited for events because he thought he could time his investments. Some of his timings were brilliant, but many were mistimed. However, over a period the scars from mistiming made him freeze and wait for events than go ahead with his investments. This eventually impacted his portfolio returns and terminal value of his portfolio. I also concluded that because he was a pilot where timing was very crucial, he tried carrying that knowledge of timing into stock markets...it failed miserably. This appears philosophical, but your experiences in life impact your investment style. As children, Charlie and I came back excited from a tour of a chocolate factory which our school had organized. We were amazed by the variety of chocolates in different sizes, shapes and smell. Towards the end of the tour, we were allowed to create our own packet of chocolates to take home. Which chocolates to take home? Which will suit our fragile stomachs? I liked white chocolates Charlie did not. Charlie liked chocolates laced with Rum (he caught on to finer tastes at a young age). I hated it. After much thought on questions which seemed like a do or die situation, we managed to create our own little packet of chocolates. Years later, I took up investments as my profession, and Charlie became a pilot. We earned well, saved well and began planning our investment. I took Charlie on a grand tour of the investment world. He eagerly learned the properties of the different asset classes. In simple terms I told him that he needs to have one year expense in a very liquid form- so liquid funds were good, even though you paid tax on them. Investing in property carries the risk of the property being less liquid- and there is regular expense to be incurred to maintain the property. Income from property was also taxable. What attracted Charlie were the characteristics of equity. It has proven to be a good class to own, as the long-term returns have been good. The income in the form of dividends were tax free, and in case the equity or the equity mutual fund is sold then there is no capital gains to be paid for long term holding. 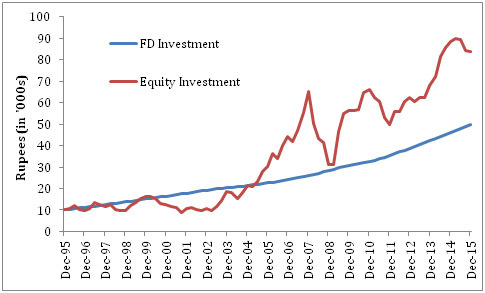 The chart shows the growth of investment of Rs 10,000 in the stock market in 1995, Vs. investing in a fixed deposit during the same period, until 2015. Past performance may or may not sustain in future and it does not indicate /assures the future performance. In terms of annual difference it was just 2.85% but cumulative the equity was Rs. 34,028 higher than the cumulative value of fixed deposit. This is 31% higher than the amount received from fixed deposit. Moreover these returns are at gross level. The after tax returns from fixed deposits are even lower. Also in equities the Capital Gains Tax is exempted over a long term, whereas fixed deposits are taxable making the returns fall further. Please refer the brief differentiation note between Equity and Fixed Deposits mentioned at the end of the article. I was glad that he started liking the characteristics of equity, as I really wanted him to invest in equities to create long-term wealth. But alas he drew a different conclusion from the graph. He asked, why stay invested in equities for all the periods, and not sell out at the peak and reinvest at the bottom. I tried educating him the futility of this effort and how difficult it was to time the market. I tried telling him about SIPs, one of the best ways to invest in the market, that allows you to harness the power of compounding (give link to earlier article) and stay invested at all times, reaping the benefits of a falling and a rising market…But it all fell on deaf ears. Charlie was a pilot and importance of timing was what he learnt. He tried that learning in investments and did not work. His portfolio crash-landed. Timing may not help, and planning and investing for the long could definitely help. Picking the right investments can confuse even the most seasoned investor. A prudent asset allocation technique could have help balance risk and give Charlie’s portfolio much needed diversification. Also understanding his risk appetite would have been very important during the process of asset allocation. Remember risk appetite could be influenced by personal experiences. Systematic Investment Plan works on the principle of rupee cost averaging & it seems to be the most practical way of investing in the market, in spite of the markets uncertain behavior. This is because, not only Charlie would have saved regularly, but SIP aims to generate returns by leveling out losses that the investment may have sustained in the middle of the term. As I explained in my last article it is a futile effort to wait for events, rather Charlie could have focused on his financial goals and aim to achieve them over a long term. First step towards financial planning is to keep aside at least 6 months of expenses as a contingency fund. This would have ensured that Charlie has enough money to take care of his needs in case of emergencies and there was no need to disturb any of his investments. Planner sheets, calculator or even our articles would have given Charlie a guideline for his financial plan, but for him to chart a plan and consider his financial goals he needed a help of a wise financial advisor.